We are pleased to welcome Irina Zhuravleva as a guest blogger today. Irina is the first author of a new paper describing a crucial role of gas turbulence in interaction between supermassive black holes and hot gas in galaxy clusters, the subject of our latest press release. Irina studied theoretical astrophysics in the department of mathematics and mechanics at Saint Petersburg State University in Russia, followed by a PhD in astrophysics at Max Planck Institute for Astrophysics in Germany. After that she moved to San Francisco area as a postdoctoral researcher at KIPAC, Stanford University. Chaotic, turbulent flows are commonly encountered in everyday life: swirling eddies of milk poured into coffee, flickering flames of a campfire, external flows over cars and ships, white froth from breaking waves in the ocean, quaint patterns of clouds in the sky and pyroclastic flow in a volcanic eruption. Complex and at first glance disordered patterns of turbulence have been fascinating and triggering the imagination of scientists and artists for centuries. Perhaps the world's first attempt to grasp turbulence was done by Leonardo da Vinci in the 16th century in his famous sketch of the swirling flow "la turbolenza' produced by a water jet from a channel into a pool. The most striking and certainly famous artistic depictures of turbulence are "The Starry Night" by Vincent van Gogh and "The Great Wave Off Kanagawa" by Katsushika Hokusai, which was later even sculptured by Athena Tacha. Interestingly, van Gogh was the only painter capable of rendering turbulence with mathematical precision1. Even more interesting cases can be found in space. 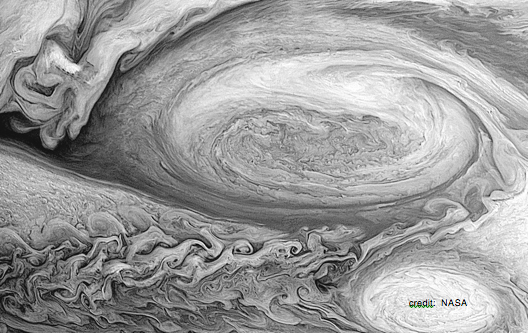 One of my favorite examples is a picture of the Great Red Spot on Jupiter made by Voyager 1 in 1979. The wealth of detail is spectacular! Similar flows of gas are ubiquitous in the Universe. Turbulence naturally arises in planet atmospheres, stars, galaxies and clusters of galaxies. Clusters of galaxies contain the largest reservoirs of gas in the Universe, which is heated to tens and hundreds of millions of degrees and, therefore, "shines" in X-rays. Extremely interesting information about the physics of the gas is provided by data from several X-ray observatories. However, the instruments are not yet capable of probing the velocities of gas motions necessary for studies of the gas turbulence. Astrophysicists will be able to do it only in one to two years, after the launch of a new X-ray observatory, Astro-H, with an innovative X-ray microcalorimeter on board. Nevertheless, I was impatient and too curious to explore this new field and was thinking about alternative, indirect ways to probe the cluster "chaos". Everything started about 6 years ago, when I was working on my first PhD project about X-ray polarization in galaxy clusters and developing a method to probe transverse motions of gas2. It turned out to be possible to do in theory, but it may take a while until sensitive polarimeters are in space. So, I switched to a more feasible future: Astro-H. Several techniques to investigate different properties of turbulence were developed3,4 and some of them were even applied to a few giant elliptical galaxies5,6. But even if Astro-H is in our near future, it would be great to have any constraints available now since there are so many unresolved triggering puzzles that require this information. The idea came from the discussion of different structures we see in X-ray images of galaxy clusters. Imagine waves in an ocean. A simple relation between the amplitude of waves and the velocity of water exists: the higher the velocity of water, the stronger (the higher) the waves. The same idea can be applied to the gas atmospheres of galaxy clusters: the gas displacement from the equilibrium position depends on the velocity of gas. But why can we see the displacement of the gas? This time imagine adding a drop of red dye into white paint, which we start stirring with a spoon. We will see red dye tracing the motions in the white paint induced by the spoon. 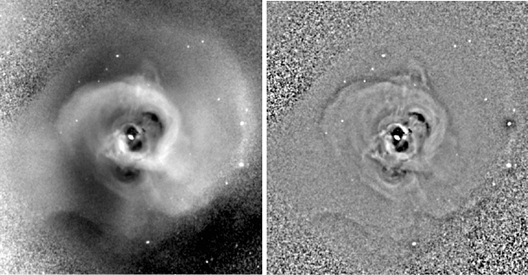 The same thing will happen in galaxy clusters, but instead of white paint we have hot gas. Instead of red dye we have gas entropy (a measure of the amount of disorder in the gas motions), and instead of the spoon we have any source of perturbations in the gas (e.g. induced by supermassive black hole in the center, motions of galaxies, different mergers, etc.). The displaced gas retains its entropy, but its density will be different from the ambient gas. As a result higher density gas shines stronger in X-rays and becomes visible as a perturbation. So, all we need to probe turbulence in galaxy clusters is to measure the amplitude of density fluctuations of different sizes in galaxy clusters7,8. We took X-ray images of the Perseus and Virgo clusters obtained from very deep observations done by NASA’s Chandra X-ray Observatory, and removed the global model of the cluster to emphasize the fluctuations (Fig. 2). The advantage of using Chandra is that it provides the sharpest X-ray images currently available, Its resolution allows us to probe even the tiniest structures present in the gas. We decompose the “messy” image with fluctuations into a set of images with filtered fluctuations of a certain size and measure the mean amplitude of fluctuations present on each image. Multiplying it by the sound speed of gas, we measure the amplitude of turbulent motions on each scale. It so much easier than I thought 6 years ago! It’s not yet the end of the story. We compared the energy released after turbulence dissipates with the rate of cooling by radiation in the cores of the two clusters and it turned out that both are comparable! This means that the balance between cooling and heating in the cores of clusters, which is regulated by the supermassive black hole, is set through turbulence. In other words, turbulence provides communication between the central black hole and the gas in the cores of galaxy clusters and elliptical galaxies9. It would be great to check it with Astro-H! (9) Zhuravleva I., Churazov E., Schekochihin A. A. et al., Nature, in press. (2014).